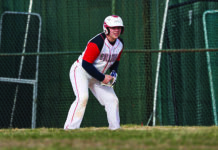 Hugh Kelleher, a junior at Gen. Douglas MacArthur Senior High School, is an award-winning multi-sport athlete, continuing his family’s impressive legacy. There are plenty of multi-sport athletes across Long Island. But few are as impressive as Gen. Douglas MacArthur Senior High School’s Hugh Kelleher. The junior star, standing at a modest six-feet two-inches, plays for not one, but three teams at MacArthur. 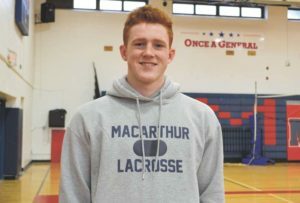 Kelleher splits his time between football, lacrosse and basketball, on top of being one of the premier students in the school’s Class of 2020. 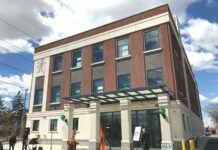 Kelleher is attempting to carry on the family legacy. One of his older brothers, Jimmy, holds multiple football records for the Generals, including setting all-time highs in several passing categories, most rushing TDs in a game (five) and in school history (27). Tom, who played at MacArthur before Jimmy, holds school records, too. Combined, the Kelleher name is in MacArthur football’s record book 11 times. The younger Kelleher came close to the single-game touchdown record, diving into the end zone four times during Sept. 29’s homecoming game against Bellmore’s JFK High School. Kelleher became one of the General’s most versatile football players in 2018, serving as a linebacker and running back. In the backfield, he excelled, breaking defenses left and right to rush for 12 TDs on the year with 1,221 yards. On the opposite side of the ball, he recorded a respectable 84 solo tackles to lead the team. The numbers Kelleher put up in 2018 were strong enough to place his name on the Nassau All County list, first team All-Long Island and the NYSSWA All-State team Class A. It’s an honor he certainly doesn’t want to forget. But football isn’t what Kelleher will focus on at the NCAA level. He’s a lacrosse star, playing midfield. The junior is committed to Cornell University, but hasn’t officially signed with the university. Rather than playing football, he will join the Big Red’s men’s lacrosse squad in hopes of leading the team to the NCAA finals. With his competitive side taking over, he’s ready for the challenge ahead.